Our jumbo sales postcards are available to cover a number of different topics. Choose from our lawn or landscape design templates, or any of our topic-specific designs.These postcards are a great way to increase your name recognition and your sales! Order them blank on the back and stock up for the future, or have us imprint them for you for your next promotion. If you choose to have us imprint them, we will contact you about the imprint once we receive your order. This postcard works perfectly as a mailer or leave-behind reminder to boost your aeration sales. 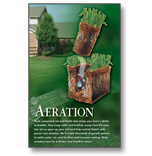 Use it to show your customers and prospects just how valuable your aeration service really is. Are your customers and prospects aware of the damage grubs can do? Use these postcards to let them know how you can protect their lawns from these destructive pests. You offer a wide variety of services to keep lawns and landscapes looking beautiful year-round. What better way to promote your capabilities than with this “Season-Long Service” postcard? The classy look of this postcard makes it great for targeting new design and installation prospects. Use it to show them how you can make an ordinary landscape extraordinary. Let your customers and prospects know that they can have the dream lawn they’ve always wanted! 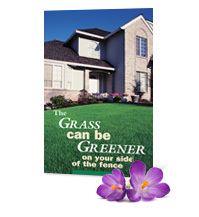 This postcard is great for promoting a wide range of lawn care services, from weed and insect control to fertilization. Homeowners who are tired of battling weeds each year will be sure to appreciate your weed control services. Use this postcard to promote your pre- and post-emergent applications. This postcard design stresses effective weed control using safe application practices. It’s perfect for promoting your pre- and post-emergent applications to homeowners with children and pets. This postcard is a perfect solution for increasing your commercial sales. Use it to show commercial prospects how you can improve the curb appeal and value of their properties with your grounds maintenance or design/build services. The eye-catching photo on the front of this postcard is a great way to draw attention to your landscape lighting services. Use it to show customers and prospects how you can increase the beauty, value and nighttime safety of their properties. Your customers and prospects may think of mulch as nothing more than a finishing touch, but you know better. Tell them how you can improve the looks and health of their landscape plants with this mulching postcard.